Has there been a void in your life since Oprah Winfrey ended her talk show three years ago? 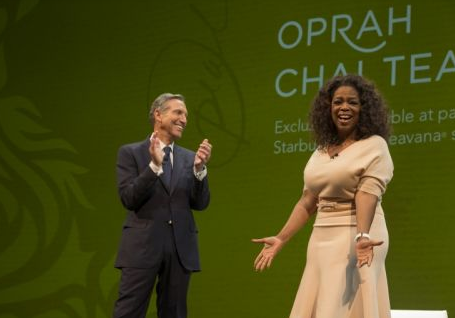 Well, Starbucks aims to fill that hole with a new product – Teavana Oprah Chai Tea. Yes, that’s right, Oprah is once again sharing one of her favorite things with the entire country…in tea form. Starbucks announced Wednesday that it partnered with the media mogul and one-time talk show host to develop a new drink to “elevate the tea experience”. Beginning on April 29, Teavana Oprah Chai will be sold in Starbucks and Teavana stores across the United States and Canada. For each product sold Starbucks will make a donation to the Oprah Winfrey Leadership Academy Foundation to benefit educational opportunities for youth, Starbucks says in a news release. Winfrey personally developed the tea, which features a blend of cinnamon, ginger, cardamom and cloves, with Teavana’s leading teaologist (that’s a real career, just like a Chocolate Futurist). For her part, Winfrey seems overjoyed with the new venture. The partnership could be a match made in (profitability) heaven for Starbucks.